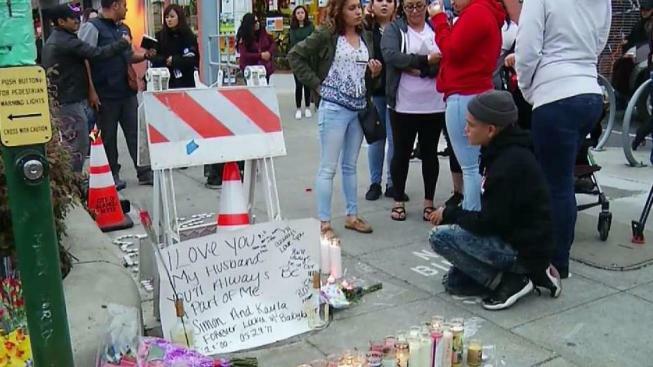 A candlelight vigil was held Wednesday night at the scene of a crash that killed two East Bay teenagers in Alameda on Monday morning. The New Haven Unified School District identified the teens, who were both 17, as Briana Ortega of Hayward, who was a senior at the Decoto School for Independent Study in Union City, and Simon Sotelo of Union City, who was a sophomore at Logan High School in Union City. Alameda police said the collision was reported at Park Street and Lincoln Avenue at 8:01 a.m. Monday and involved a minivan with a single occupant and a truck carrying seven people. Ortega and Sotelo were both in the truck. Ortega died at the scene, and Sotelo was transported to Highland Hospital where he was pronounced dead. Five other occupants of the truck were transported to a hospital with critical injuries. A woman driving the minivan was also hospitalized with injuries that were not thought to be life-threatening. The candlelight vigil at Park Street and Lincoln Avenue was organized by Ortega's family, school district officials said. Information about funeral services will be released when the details are finalized. School district officials said grief and support services are available for students and staff members who've been impacted by the deaths of Ortega and Sotelo.